The final week of the 2012 Summer Games have come, sadly, to an end. And while the final fireworks fired from the Olympic Stadium (truly the best use for gunpowder), millions of people worldwide have been inspired by the breathtaking feats of the athletes and thankful that no acts of senseless violence have marred the Games. There have been so many unforgettable moments – the fact that every nation’s team included women for the first time, the breathtaking soccer games, the sleek and speedy swimming champions, and, of course, the high flying courage of the gymnasts. But certainly one of the greatest memories from the games was when Usain Bolt ran, winning gold in the 100 meters, the 200 meters and anchoring Jamaica's world-record gold medal performance in the 400-meter relay. The speed, the elegance of form, his supportive gesture of the first physically challenged runner marked him as a modern athlete in the true tradition of the classic Olympic spirit. So how does one celebrate winning triple Olympic gold in London? Bolt chose to celebrate by enjoying a large Nebuchadnezzar size bottle of Armand de Brignac Champagne (also known as the Ace of Spades Champagne) at the very hip club Movida. Don't worry that his future endorsements will have to cover the final tab for the bottle – £80,000 (US $125,496)! It was comped - thank goodness! But lest you think fame has gone to his head, he shared the fun and this world-famous gold toned bottle of champagne with his assembled fellow medal winners. Well done Bolt! And well done London! It's been a great two weeks! What fantastic Olympic Games! Rio, the selected site for the 2016 Games, will have to work very hard to top the 2012 London Olympic Summer Games, that’s for sure. Bravo Britain! 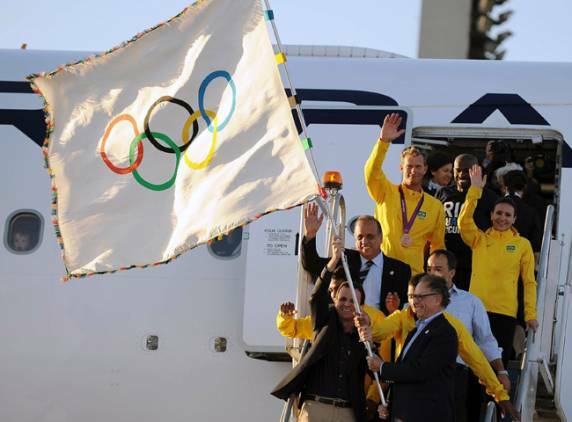 Post Note, August 14, 2012: The Olympic flag has been transferred to Rio de Janeiro, which will host the 2016 Summer Games. Considering that Rio will also host the 2014 World Cup Soccer Games, all things Latin American are sure to be an emerging culinary trend. Posted on August 13, 2012 by Ana Kinkaid and filed under Alcohol, Awards, Beverages, Champagne, Club, Courage, Elegance, Great Britain, Music, Sports, Travel, Trends and tagged 2012 London Olympics 2012 Olympic Unforgettable Moments 2014 World Cup Ace of Spades Champagne Armand de Brignac Champagne Center for Food of the Americas David Beckham Don't Stop Me Now Gymnasts John Lennon Latin Food Trends Queen.